Interview: Gillian Jacobs, Director Of 'The Queen Of Code' : All Tech Considered Gillian Jacobs, known for her role as Britta Perry on Community, directed a short documentary on the computer programming pioneer. She says Hopper wasn't fond of the hype over her accomplishments. 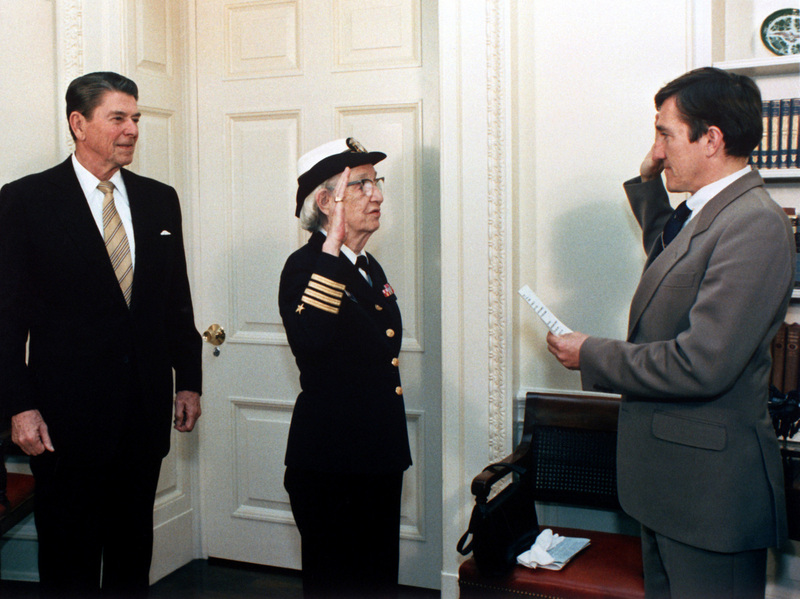 Secretary of the Navy John Lehman (right) promotes Grace Hopper to the rank of commodore in a ceremony at the White House with President Ronald Reagan. In today's male-dominated computer programming industry, it's easy to forget that a woman — Grace Hopper — helped usher in the computer revolution. During World War II, Hopper left a teaching job at Vassar College to join the Navy Reserve. That's when she went to Harvard to work on the first programmable computer in the United States: the Mark I.
Gillian Jacobs is best known for her work as Britta on the TV show Community. Gillian Jacobs, best known for her role as Britta Perry in the comedy television show Community, has directed a short documentary about Grace Hopper titled The Queen of Code. "These people were making it up as they went along. The computers they were working on were the size of rooms, they were breaking down constantly," Jacobs says. 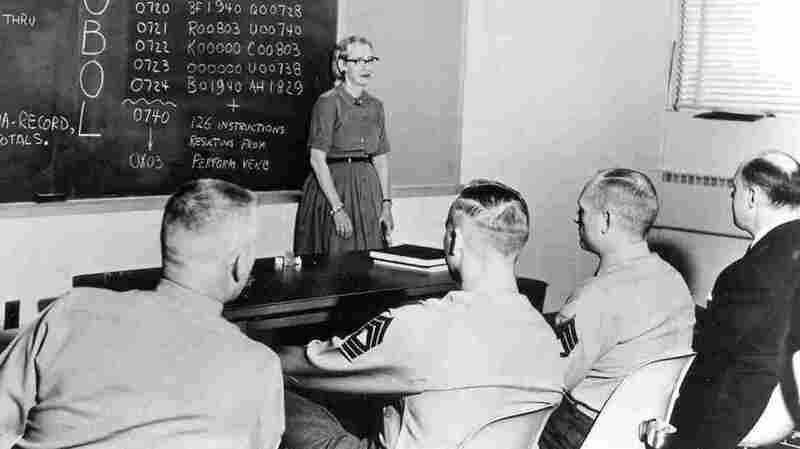 Women were responsible for programming early computers, and Hopper led the charge. Later in her career, Hopper helped create a common language that computers could understand. It was called common business oriented language, or COBOL — a programming language still used today. Rear Admiral Hopper went on to become the oldest serving officer in the United States Navy. She died in 1992 at the age of 85. You can watch the documentary The Queen Of Code at fivethirtyeight.com. Grace Hopper joined the Navy during World War II and served on and off until 1986. She was always in full Naval dress. She wore cat-eye glasses. She's a very tiny woman. She managed to ride the line between being forceful enough to get what she wanted accomplished and she referred to herself as a pirate within the Navy. She would go in the middle of the night and steal office supplies. Anything that wasn't glued down she thought was fair game. And she said that she would just march into her superior's office and demand things. But she was also incredibly funny. She's a fascinating woman. I don't know if Grace Hopper herself coined that term, but it's often associated with her that we now think of debugging. On Grace Hopper as the "queen of code"
Grace Hopper was able to succeed in a number of male-dominated institutions: the Navy, the computing industry. And yet she never considered herself a feminist. I have a clip in my documentary where she's asked by an interviewer, "What have you made of the women's [liberation] movement of the last 20 years?" And she said: "I don't know much about it 'cause I didn't have to worry about it. I was in the Navy." There's a celebration named after her; she's got a destroyer named after her. But she herself kind of had disdain for that. It's sort of the two at play — her public image as this sort of icon of computing, and then the woman herself who probably would have taken a pin to that balloon. At the end credits of my piece, I have one of her biographers, Kathleen Broome Williams, saying she thought Grace Hopper would hate the title Queen of Code.